The Gospel Gangstaz formed their musical association after rival ex-gang members, Mr. Solo, from The Crips, and Tik Tokk, from The Bloods, became prayer partners at the Church in which they were born again. In the early stages of his own walk with Christ, Mr. Solo personally ministered to his friend and fellow Crip, Chille Baby, who accepted Christ, and was later invited to be a member of the Gospel Gangstaz, along with the group’s DJ, DJ Dove. The Gospel Gangstaz are renowned for their ministry focus of spreading the love and hope of Christ to young men and women with violent pasts or drug problems, and continue to reach out to these groups of society with their gangster-oriented musical sound. In 1994, the Gospel Gangstaz released their debut album, Gang Affiliated. Their third album, I Can See Clearly Now (1999), their debut album on major label, B-Rite, received a Grammy nomination in the Best Rock Gospel Album category. This same album also received nominations in the Rap/Hip Hop/Dance Recorded Album of the Year category at the 31st Annual Dove Awards, along with a nomination for Rap/Hip Hop/Dance Recorded Song of the Year category for the song I'll Be Good from the I Can See Clearly Now project. Other releases from the Gospel Gangstaz include Do Or Die (1995), The Exodus (2002), The Flood (2006), and Street Disciples (2011). 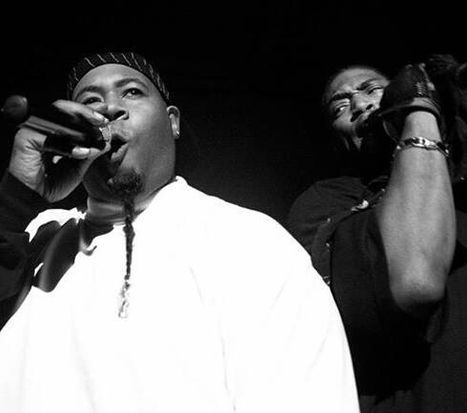 The Gospel Gangstaz have also featured on albums like DJ Dove's The Devil's Worst Nightmare (1996), The CMC’s Everyday Death Sentence (1996), and Woody Rock's album, Soul Music (2002). The group has also shared the stage with major headliners, like Kirk Franklin and Mary Mary. Veterans in the industry, they helped shape and mould, the Gospel Gangstaz continue to deliver the hope of the Gospel of Jesus Christ, through the relevant medium of Hip-Hop, to a section of society that most people hold no hope for, and a people who are seldom reached by the traditional four walls of a church. The Gospel Gangstaz have become an institution of sorts, bridging the gap between the church and the street, delivering not only a message of truth, hope and salvation, but a musical sound that is unashamedly street and distinctly "G'd Up". In further efforts to give back to their community, the Gospel Gangstaz founded a non-profit, entitled, Extended Hand. They continue to work on developing their own brand of goods and services through Camp 8 Records, Camp 8 Film, Camp 8 Clothing line, and Camp 8 Sneakahz shoe line, all of which hold some purpose in giving back to their community and spreading the Gospel of Jesus Christ.